Data from the Global Information Technology Report 2016 shows that Italy is one of the countries that improved the most during the last year its ability to leverage information and communication technologies to improve its competitiveness and the well-being of its population. The country has gained 10 notches and reached the 45th position in the Networked Readiness Index (NRI), an aggregate index that assesses the countries’ overall environment for innovation and ICTs (information and communication technologies). It also measures their readiness for ICT uptake; the level of usage by companies, society and the private sector; and overall level of impact on society and the economy. 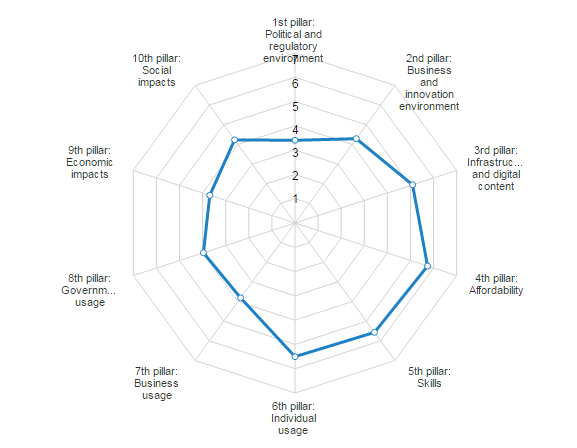 While Italy’s improvement reflects efforts by the national government to improve regulation and digital infrastructure, the country’s performance is not uniform across the areas of networked readiness. Some areas, for instance, show an increase in the government’s use of digital technology, while others show signs of deterioration. It seems the political and regulatory environment – for which Italy ranks 96th – still represents one of the country’s Achilles heels. From the outside, such a non-uniform performance across different indicators might seem hard to decipher. However, looking at the Italian government’s latest major interventions in the regulation of digital technology might help us to understand. 2. Developing normative and digital infrastructures to foster innovation in both public administration and industry. Italy has been the first country in the world to approve a Declaration of Internet Rights through a parliament vote: the Italian Bill of Internet Rights was ratified on 28 July 2015 by the Chamber of Deputies and paves the way for digital citizenship. Additional progress has come in the form of the Italian Freedom of Information Act and the modification of the copyright law of 1941, which has been updated to cover telecommunication networks. On top of billion-euro investments in broadband access, the new strategy for ultra-fast internet connection expects to raise €12 billion to meet the EU h2020 broadband targets. The first rounds of investments are being channeled into areas that are suffering market failures. These advances in internet rights and bandwidth have been complemented by the realization of the Italian strategy for digital growth, which includes the constitution of a coalition of associations, companies, institutions and foundations, which will support projects that develop digital competences. In parallel, Italy is renovating its digital infrastructure: open data in strategic sectors (for example transportation), a strategic model for the evolution of the public information system and a “digital school plan”. An important step has been the recognition, since 2015, of start-ups in the Italian juridical system, the set-up of an online procedure for the constitution – as of July 2016 – of innovative companies, complemented by the revision of the legal requirements for innovative companies to receive economic support, which enlarge the set of possible applicants. However, from a holistic perspective, the benefits of such interventions are also dependent on other important factors regarding, for example, public support to the education system (Italy is not performing well in terms of government expenditure on education), investments on research and development (which is lower than in leading European countries ), population’s ICT usage (e.g. internet users), and other major legislative interventions that might change the whole institutional framework (in particular, a relevant constitutional reform which will undergo a public vote towards the end of 2016).